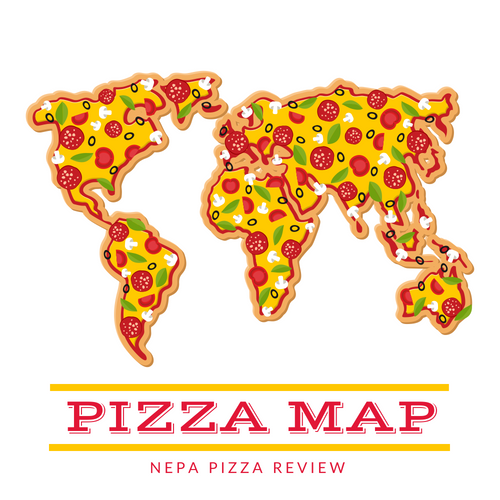 As I continue my quest to taste and review every pizza in NEPA, I feel as if I have not yet even put a dent into the many pizzerias in the 570 - even as I sit here writing my 80th review! To start out, I focused heavily in Clarks Summit, Scranton, and Dickson City, but now I'm trying to get into the smaller towns in Lackawanna County and move down the line to Luzerne County. 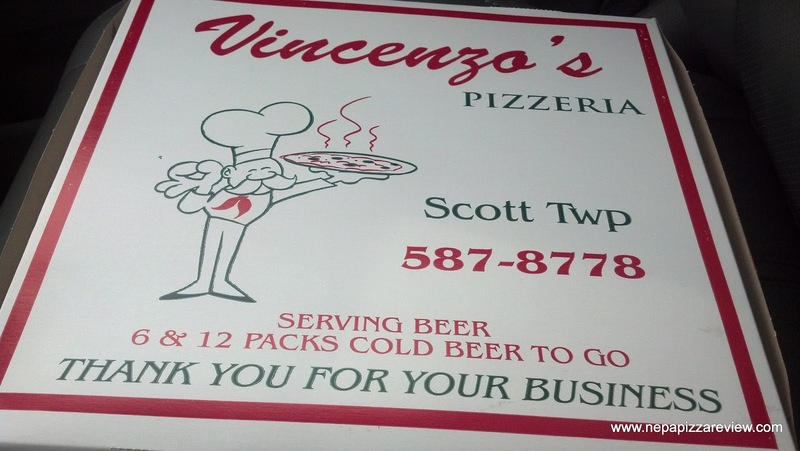 Today, the pizza mobile and I made our way to the small town of Scott Township Pennsylvania where Vincenzo's Pizza is located. 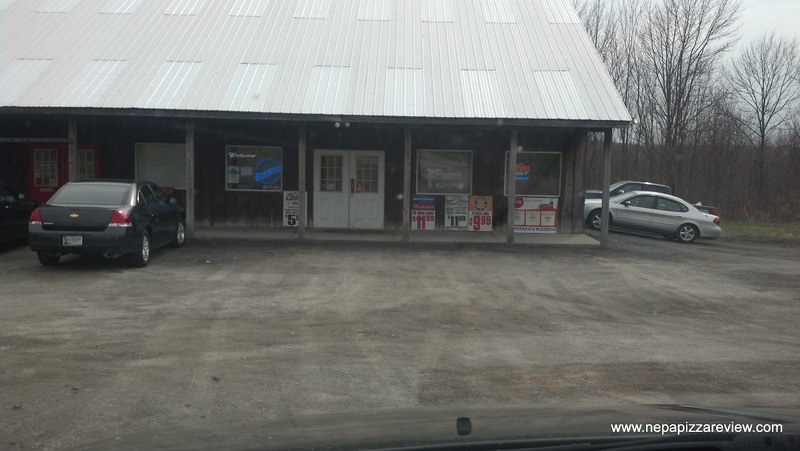 Anyone who lives out this way knows that good pizza is not easy to come by compared to the selection you have when you head a bit south on Interstate 81. I was doing a little shopping at Weis Market and traveling past the Scranton Times building by I-81 when I remembered Vincenzo's was just across the street from the Times building. I placed an order while I was shopping and it was ready for me to pick up in less than 15 minutes. If you are not familiar with this location, it's tucked in a rural strip mall just behind the car wash across the street from the Times Building (as I said earlier) which is just off the Scott exit of I-81. 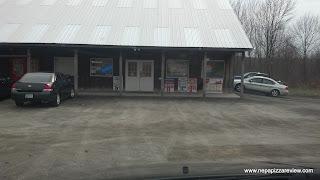 The location is actually very convenient - easy to access just off the highway with plenty of parking. When I walked in, I got the impression that this was more of a take-out joint than a full service restaurant, but I didn't get a chance to really look around much. 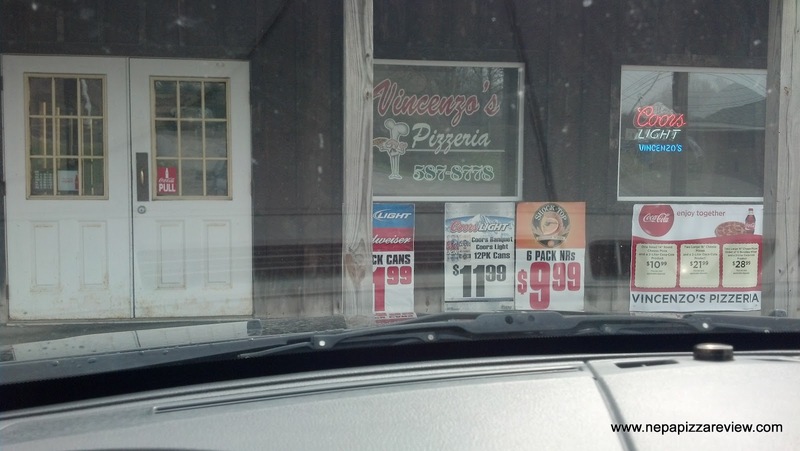 I did notice that they sold 6 packs of beer, which is a nice option for you adults who like some spirits with your pizza especially with so few other options in the immediate area. I inquired as to whether this Vincenzo's location was affiliated with the Vincenzo's in West Scranton, and the owner confirmed that they were in fact related. I'm always fascinated with reviewing pizzas that have the same recipe but are made in different locations (excluding corporate chains) because I enjoy comparing the nuances of the pies. I hold firm to my belief that 100% of the ingredients can be identical, but if they are put together and cooked in different ways, they will taste very different as was somewhat of the case here. The owner did mention to me that people do say the pizza tastes a bit different than the West Scranton Vincenzo's pizza, but he does use the same ingredients. This would confirm my theory before I even started eating! For the record, the owner seems like a good guy and clearly runs a tight ship just like the Scranton location as the place is immaculately clean. 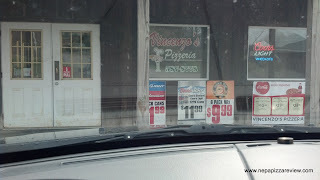 I exchanged my cash for the pizza and made my way back to the pizza mobile eager to do yet another review on the run. I carefully propped the pizza on my seat so that it rested level, grabbed my first slice and headed for the open road. The first thing I noticed was that the cheese was running on top of the pizza and was difficult to pick up because the cheese was so stringy and moist. 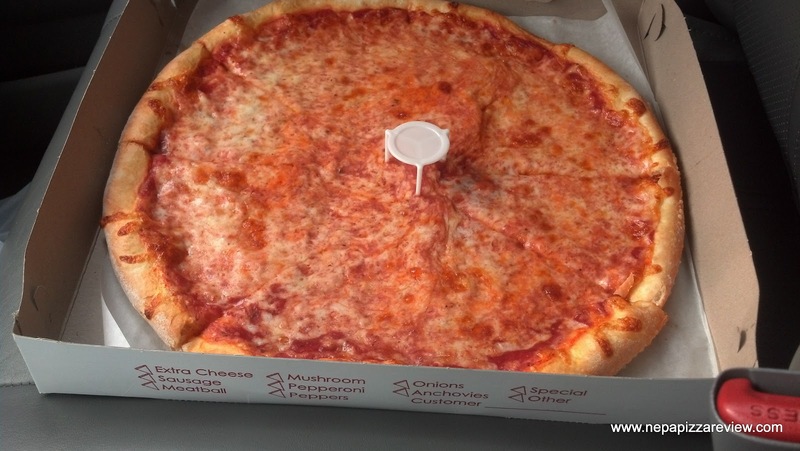 In my opinion a stringy cheese is typically a good cheese, so no issue there, but it was difficult keeping the cheese on top of the pizza, which demonstrates a possible issue with the sauce. To round out my first impression, I will say that this pie was constructed with care by a quality pizza maker, perfectly round, stretched evenly, and just appealing to look at. As I said, I liked the cheese as it was moist and delicious. It had a good amount of flavor without being too salty like some mozzarella cheeses tend to be. The cheese was definitely my favorite part. The sauce was pretty good, but it was watery and caused the cheese to flow around the pizza in the box. 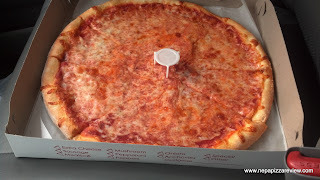 It also didn't allow for the cheese to be anchored to the rest of the pizza, so it was one of those pies that you bite into then kind of slurp up the cheese. The flavor of the sauce was pretty good, but I think with a little less water, the texture would be better and the flavor would be more prevalent. The crust was also very nice. I definitely liked the dough, as it had a nice flavor, decent bubble pattern, and was soft yet crispy. The watery sauce did slightly sog up the crust a little faster than I would have liked, but really I couldn't or wouldn't complain. The pizza was cooked well - the way that most of America likes it, but as usual I would have liked another minute or two in the oven. This pizza was NOT undercooked in this case, just a matter of personal preference. 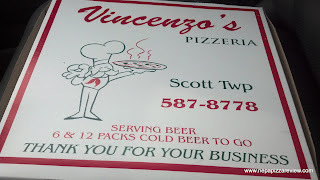 Overall I have to say that I did enjoy the pizza at Vincenzo's, although maybe not quite as much as I did at the West Side location, but I will say that Vincenzo's in Scott Township does have the best pizza in the immediate area that I have tried, and this pizza will absolutely appeal to the masses. Plus it's a pretty good value for the size of the pizza and quality of the ingredients that the place is using.